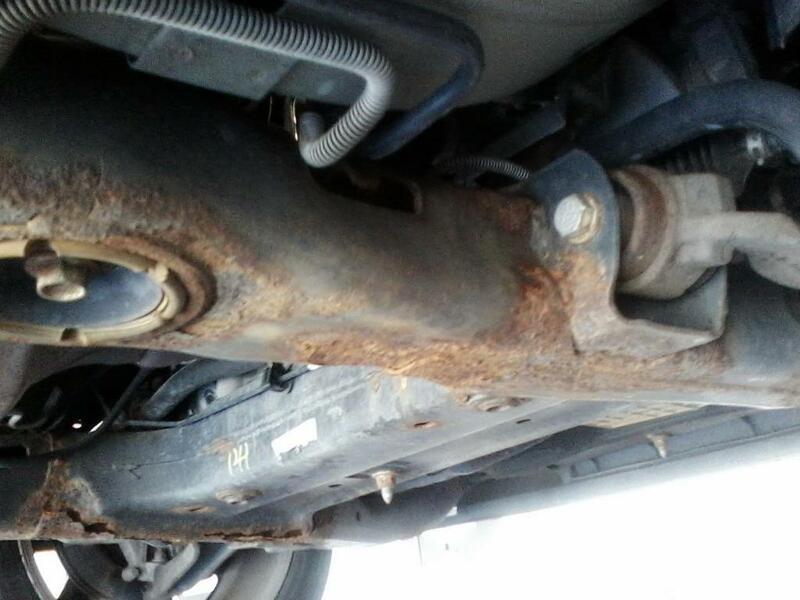 CarComplaints.com Notes: Engine cradle rot is a serious problem in the 2004-05 Chrysler Pacifica. Chrysler admits they didn't apply enough coating to the vehicle's sub-frame during assembly, but only offered to cover a very small portion of the vehicles they messed up. So what happens when your engine cradle rots? Well, the engine could fall out for starters. It could also cause problems with the suspension and other components but did I mention THE ENGINE CAN FALL OUT? The worst part is you might not know because there's no way to see the problem without getting under the car. 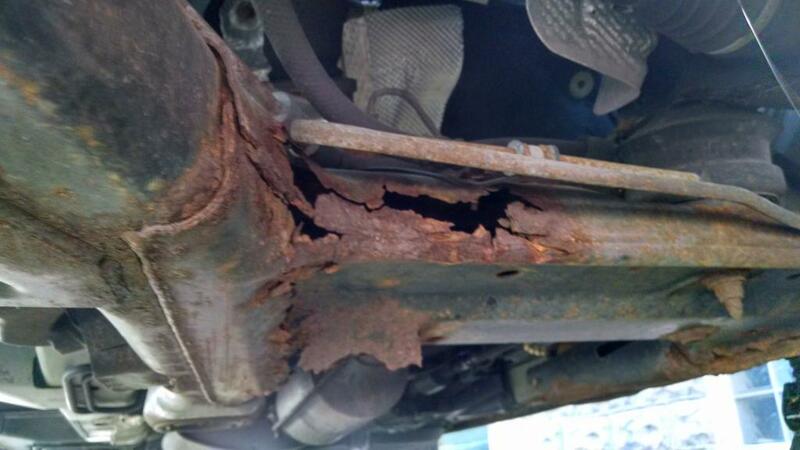 If you have a 2004-05 Pacifica, make sure to have your mechanic inspect your sub-frame for rust and corrosion. No one has added a helpful site for this 2005 Pacifica problem yet. Be the first! I just want Chrysler to fix their junk! the engine and transmission are ready to fall out of car! MY ENTIRE FRAME, UNIBODY AND ENGINE CARRIAGE IS RUSTED COMPLETELY THROUGH!! The engine is about to fall out onto the ground, and both wheels have turned inward. THE CAR IS NOT SAFE TO DRIVE!! .. And I still owe thousands of dollars on it! I began feeling a shaking in the steering wheel several weeks ago. Last week, it became almost impossible to hold the vehicle steady on the road, so I took it in for a brake inspection... The entire frame / unibody / engine carriage has pulled apart, and the engine is about to fall out! Both axles are also perforated from the frame. The mechanic instructed that I not drive the vehicle home. Estimates to replace the unibody were $3000+. (My vehicle currently holds a trade-in value of $3000.) I did file claims with both my auto insurance and with the extended warranty company. 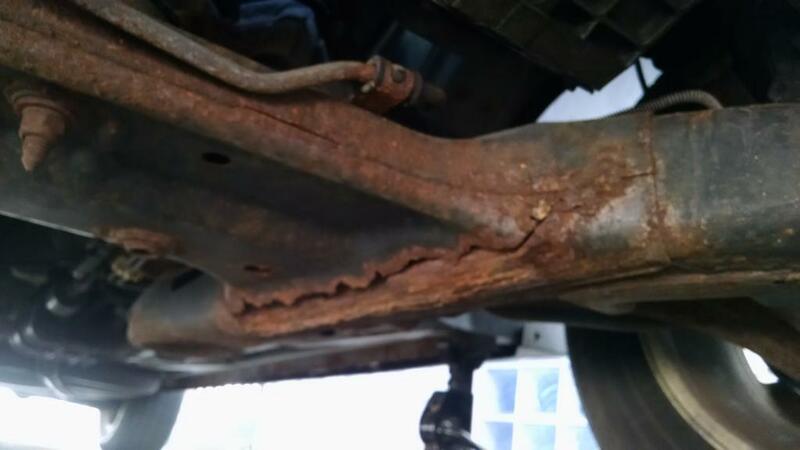 Both were denied, citing that rust is not a covered claim, that it is "wear and tear". I also contacted the Chrysler Group, and was told that they would not be helping me. The damage is HORRIBLE!! I have driven this car daily, and often with my grandbabies!!! ... and CHRYSLER HAS KNOWN THAT I (AND SO MANY OTHERS) ARE TRAVELING IN THESE CARS WITH BROKEN FRAMES, WITH ENGINES READY TO FALL OUT AND WRECK THE CAR!!!!!! Update from Aug 16, 2017: This is a safety problem that Chrysler needs to deal with quickly before someone is killed. Why has this not been a recall item? It's dangerous enough? THE CAR IS A DEATH TRAP. I CANT HAVE MY FAMILY IN THAT CAR. I TOOK IT TO GET A CHECK UP AND THE MECHANIC BROUGHT IT TO MY ATTENTION,THAT MY ENGINE CRADLE IS ON A THREAD. I BOUGHT THE CAR USED,GRANTED. BUT THE FACT THAT THIS IS A COMMON ISSUE WITH THIS CAR IS HORRIBLE. I WENT TO SEE IF I COULD GET IT WELDED,BUT ITS IN SUCH A BAD SHAPE THAT IT CANT BE TOUCHED UNLESS I GET IT REPLACED..... I CANT AFFORD IT. AND THE REPAIRS COST ALMOST AS MUCH AS I PAID FOR IT. IM SO DISGUSTED. THIS IS MY FIRST CAR AND I GOT BURNED ON IT. GOOD JOB CHRYSLER!!! I bought the car in March of 2017 and it's only been four months and I'm having problems. Chyrsler doesn't want to fix it and the car lot I purchased it from doesn't either and I have three kids and this the only ride I have. I need help, I don't know what to do, it is rusting out all at the bottom. And they charge me 6500 for this truck I paid down 3500 and I'm still paying a car note for a vehicle I can't even drive...SMH the axle burst and it's making a noise. The a frame is gone . I have owned chrysler products for 30 years. If this is how they are I will change to some other brand. I don't know what to do. It is rusted so bad I'm afraid the engine will fall out. Its not worth repairing but I don't want to just junk the car. There is little to no rust anywhere else on frame but this is rusted out. It has to (HAS TO) be a manufacturer defect. Took my car to Bettenhausen in Orland Park, IL because we noticed it was leaking fluid onto driveway. 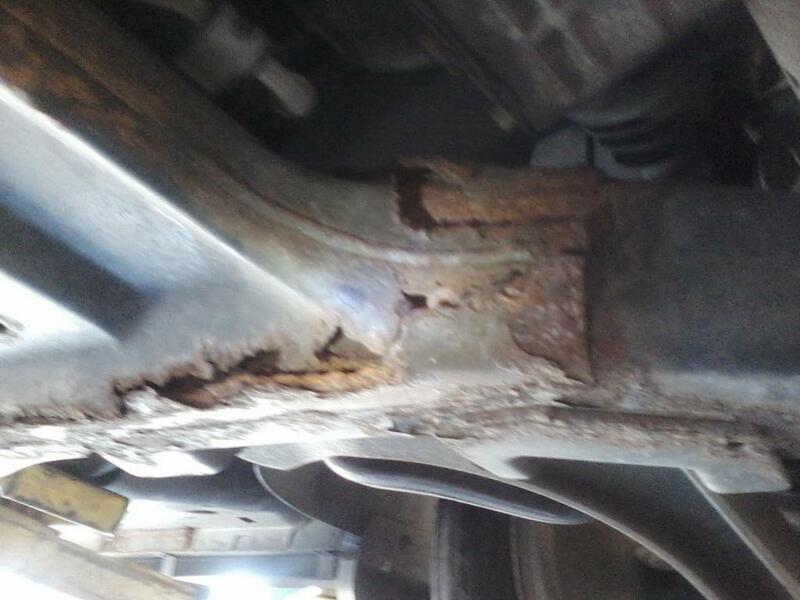 The technician told us the subframe was rotting out and we should look into getting another vehicle as soon as possible, as this could be very dangerous out on the road. I purchased my brand new Chrysler Pacifica in 2005 and have loved it for many years. Now I learn that there is a dangerous defect that could cause a serious accident (or even death) and Chrysler is not willing to fix it. Very disappointing. I am afraid to drive my car, yet I cannot afford to get it fixed. if other company's can step up and fix their mistakes why can't chrysler. do they need to wait untill there is a fatality before they admit they screwed up. all i want is the car fixed and thats not asking a lot. sub frame and main frame rusted through. the car was seviced at the dealers every 3000 miles and neaver did the service dept inform me of a rust problem even after tsb had been issued. the car became a road hazard a;nd was junked . price to repair too high. garage stated unrepairable. They are telling me I should not even drive the car, and the engine could have fell out. I have a 6 year old! I have to work. I was informed last night by my mechanc that the entire subframe is rotten in my 2005 chrylser pacifica, after being informed of the rough estimate to fix the subframe rot I did alittle research and found this a know defect in this particular make and model and there is legal action being taken against Chrysler related the known defect in this vehicle. I spoke with a representative at Chrysler this morning who informed me that my particular car is not covered and the recall doesn't apply to my car of course!!! I am beyond frustrated and am looking for a little insight into similar situations with particular make and model and if Chrylser was any help at all. Took my 2005 Pacifica to the dealer, where I bought it new, for service today, which I do every 3000 miles. Manager had me look under the car. I was totally shocked to see that the engine carriage frame was so badly rusted that the manager said it would be dangerous to drive like it is. Both sides of the car are severely rusted. I was told it would run around $3600 for the front, but nothing could be done for the sides. This car is my baby! I have taken meticulous care of it and planned on it being the last car I would need to buy. I am 71 now. Looking on the web I saw that a class action lawsuit has been filed about this problem and that dealers where made aware of it. If this is true, why didn't Chrysler or Al Smith Chrysler in Bowling Green, Ohio notify me of this? Early on, the car could have been coated, which wasn't done at production, and I would be a happy camper. Don't tell me about salt. I washed my car after driving in salt. This is inexcusable! I trusted Chrysler. I love my car. What do I do? On SS and can't afford a different car. Stand up Chrysler and take care of this problem. After all, it is a problem you made and became aware of at an early date. How can I add my name/car to this lawsuit? just need to know if there is help for the problem. I own a 2005 Chrysler Pacifica with 118,000 miles on it. The car has a lot of life left in it but I can't drive it because the subframe is so rusted out, I would be putting my life on the line every time I got behind the wheel. So, it's basically totaled, insurance doesn't cover that, the exorbitant cost to fix is not worth it and there is no recall on this! How can that be? They know this is happening but they aren't willing to fix the problem? Have there not been any deaths from the engine or transmission falling out when someone is driving down the street? Does there need to be a certain number first? I am disgusted. I saw a class action lawsuit was filed for this, I wish I knew how to join that! I took the car in because I heard something loose in the front end. 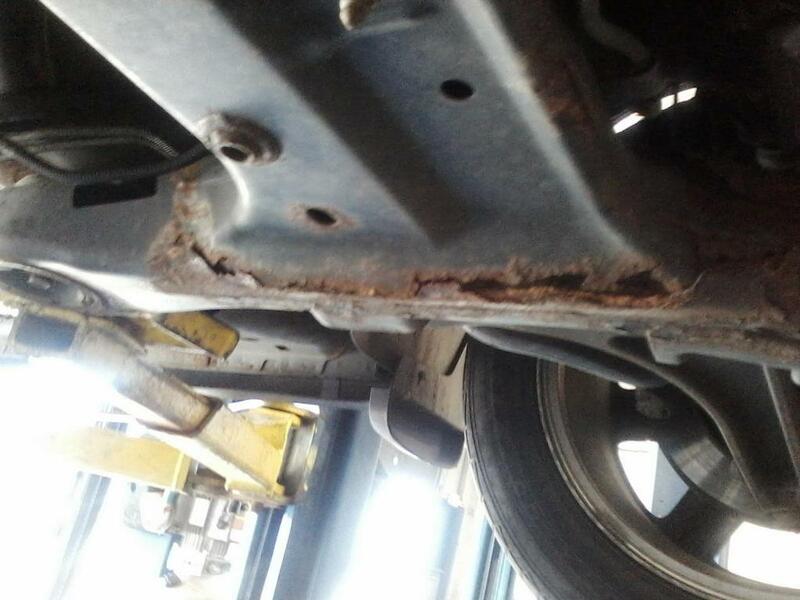 The mechanic inspected it and reported that he had found significant rust-through on the sub-frame! He said it is absolutely unsafe to drive. He also said that it would cost a minimum of $2,500. to fix (if all went well). At this point, I'm not sure what to do. 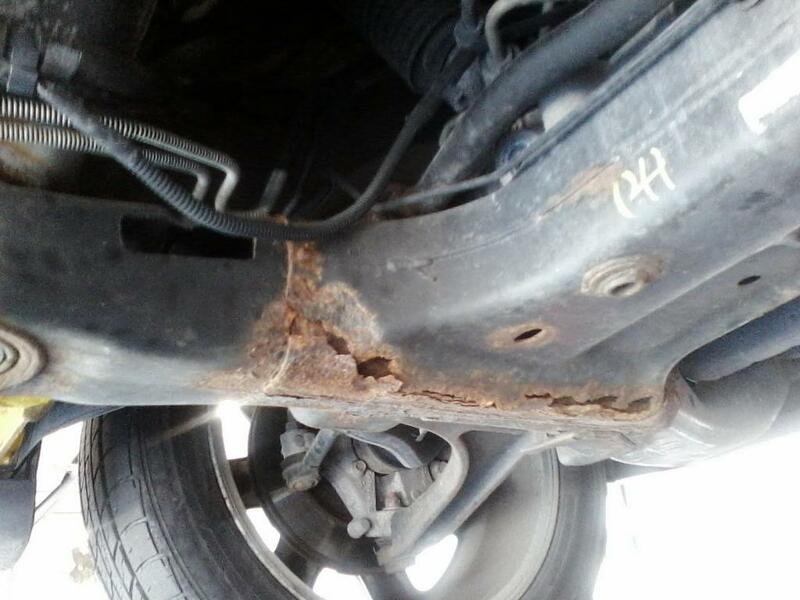 Rust under the vehicle. Can cause accident. The engine can fall off or something worst can happen. Two years ago we had to have major rust repair done. Rocker panels were rusted. That was $1200. This week the car would not pass inspection again. Rotted cross-member this time our mechanic said. 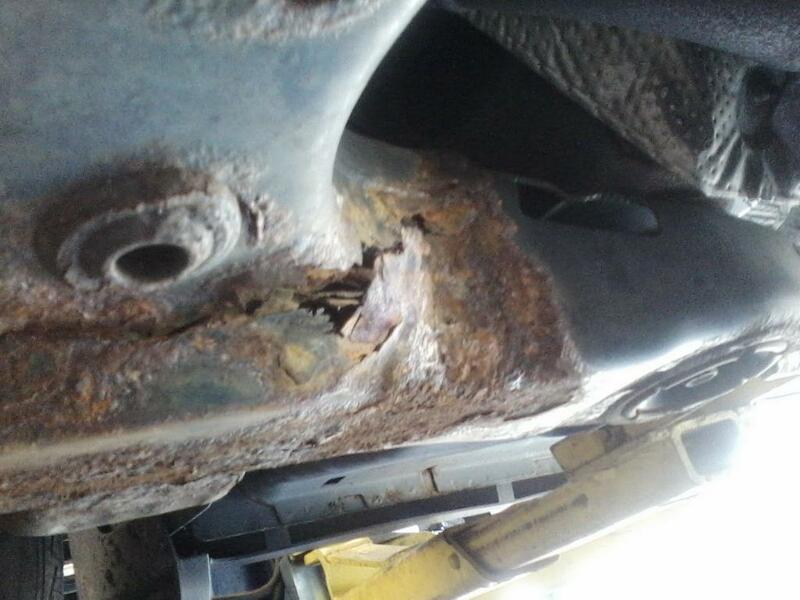 He sent us to Dodge dealer who said subframe is rotted. He has given us an estimate of $1885.40 for the part and $600 for labor. We have no choice but to do this as we cannot afford to buy another car and have a car payment. I have read this is a major problem with this car. I do not understand why there was not a major recall by Chrysler since this issue has been going on for a number of years and is caused from a defect by Chrysler. I saw there are some class action suits that have been filed this year but we are not sure how to be involved in these if it is even possible at this point. My wife and I have had a lot of medical issues the last two years and she has had to retire and this is the last thing we need with all our medical bills. It is so sad that these days that major companies do not step up and take responsibility for their mistakes. I know it is about their bottom line but we have a bottom line too. They do not care about the little guy anymore, just about their big company. We have loved this car for years and still do but are so upset that now it is taking so much of our money, more than we ever thought possible.